Note: This app is exclusively made for devices with built-in compass. 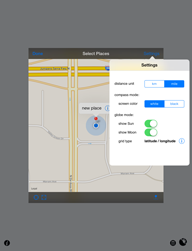 In addtion, the location information has to be able to be received by Wi-Fi or GPS, etc. Note: AR mode is for devices with built-in camera. Globe mode (no camera image) is for other devices. In default setting, 18 cities are selected, of which 10 cities are displayed. In compass mode, direction and distance following the great circle of the earth is shown. 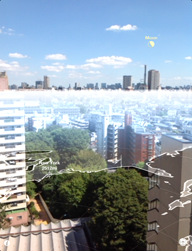 In AR mode or globe mode, direct direction and distance piercing the earth is shown, and current position of the sun and the moon is shown, overlapping with camera image in AR mode for devices with built-in camera. 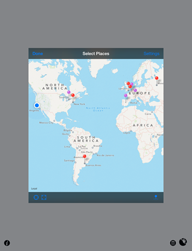 You can easily add or move places in the "Select Places" screen. Red pins are places displayed in compass screen and AR screen, and purple pins are places not displayed in the two screens. 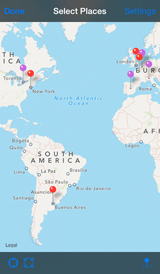 Drag the pins to exact places you like. In the "Edit Place" screen, you can change/delete names and display/hide places. 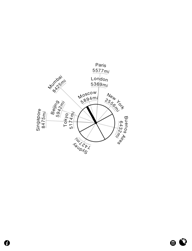 Select your distance unit, km or miles. 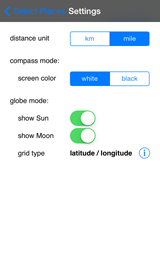 For compass screen, you can select from two color variations, white and black. For AR screen or globe screen, you can select showing the sun and the moon, and grid type. 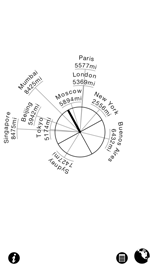 ※The globe is assumed to be a sphere with the radius of 6,371,007.1810m (mean radius of GRS80 ellipsoid). ※The precision of direction and distance is dependent on precision of location service and electronic compass installed in device, and it may vary under certain conditions. ※If there are places with the same name and same position, only one of them will be saved.